Brite-Lite Lighting and Electrical Wholesalers have been supplying businesses over the past 37 years with their industrial, commercial and residential lighting and electrical requirements. This is a leading electrical distributor in the Prairies and have a great osCommerce store with hundreds of electrical products. Want to upgrade online presence of your business? PlatinaIT is a leading osCommerce web design company that will take care of all your IT needs. Consult the reputed firm by calling on (416) 273-7206. Our 37 plus years of doing business has allowed us to grow our knowledge in lighting and electrical business so to help provide the right solutions to all businesses. 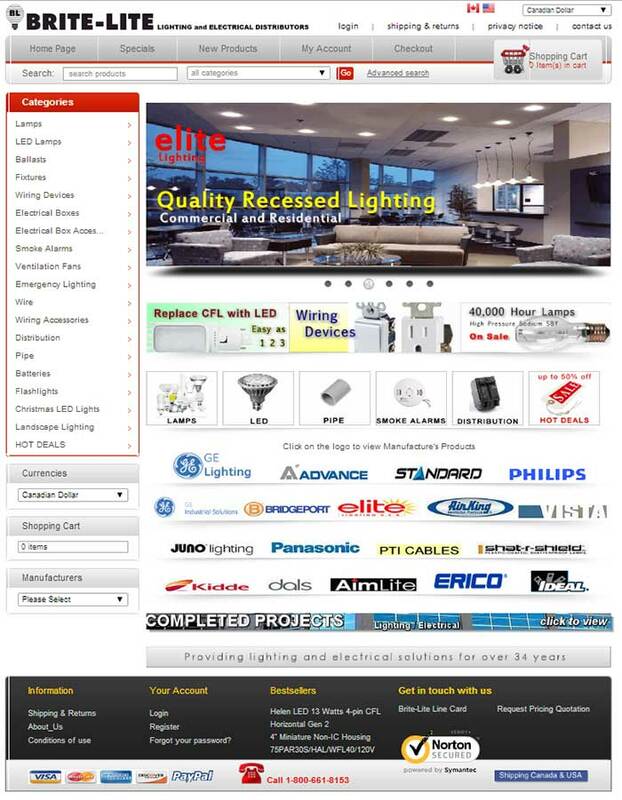 I would like to take a moment to say how pleased we are with your services and all that you have done for the online presence of Brite-Lite Lighting and Electrical. After starting the design process in osCommerce technology, it did not take long for me to see the desire and knowledge you had about taking Brite-Lite Lighting and Electrical to the next level on the web. Once our website was up and running, we had countless clients inquiring about who designed our site, and a large portion just obligating on how clean, precise and original it was. We have continued to get frequent greetings on your work. Thanks.